Nitro-V stainless stonewash blade is 3-1/2" long. Closed knife:4-47"
Frame: Titanium, bronze and carbon fiber. Copper skull spacer and king skull bead. Caged bearings pivot. 1095 high carbon steel blade is 3-3/8" long. Closed knife: 3-1/4"
File worked anodized titanium liners and back strap. Titanium thumb stud. African Blackwood scales. Blue G-10 bolsters and clip. Damascus blade is 2-3/8" long. 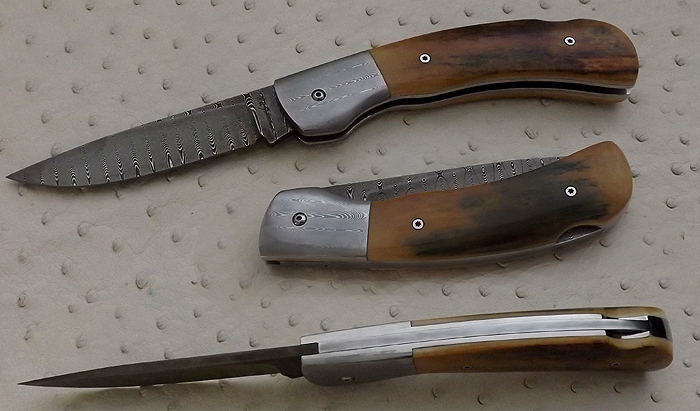 Closed knife: 4- 5/8"
Crown stag handle and fitted tooled belt sheath by Bob Scharp. Manhattan special 2 - frame lock "flipper"
AEB-L stainless harpoon blade is2-5/8" long, 60-61HRC. 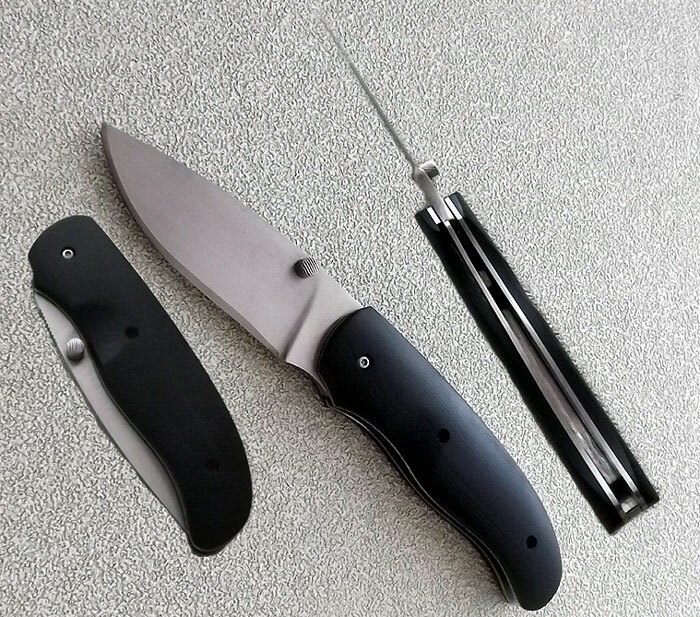 Closed knife" 4"
Titanium locking side, titanium pocket clip. G10 show side (brown or orange). Ceramic detent, caged ball bearings washers. Aluminum covered and anodized steel screw. AEB-L stainless blade is 3-1/2" long, 59-60 HRC. Closed knife:4-7/8"
Red coated titanium spacer. Lanyard with hussar skull in helmet bead. 1095 steel blade is 3-1/2" long. Closed knife: 5"
Titanium liners and file worked backstrap. 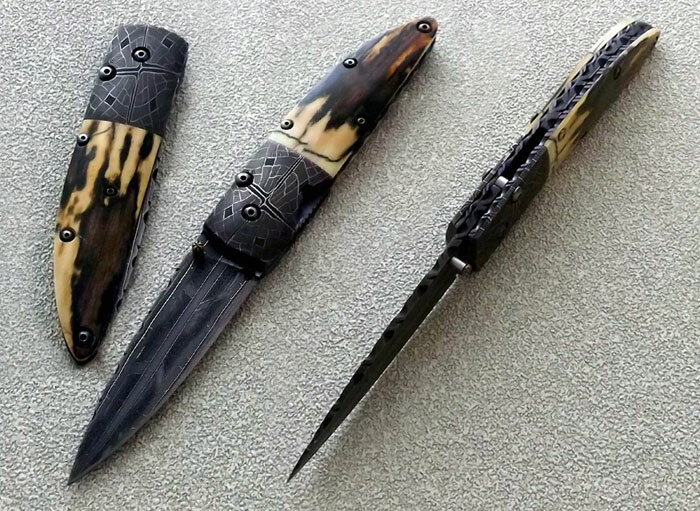 Stabilized giraffe bone scales on Black G-10 lining. Citrine inserts in the blade. Pivot runs on bearings. frame lock folder " shadow"
CPM-154 blade with IKBS bearing system is 3-3/4" long. Closed knife: 5-1/4"
Titanium frame w/hinderer lock bar stabilizer, bolster and clip has orange peal finish. Carbon fiber scale. Damascus (maker's) blade is 2-3/4" long. Closed knife:3-5/8"
ATS-34 mirror polish blade are 1-1/2' and 1-7/8. Closed knife: 3-1/4"
Titanium bolsters liners and back spacer. Ivory scales. Knife opens by rolling blade with thumb rested on it's grooved base. 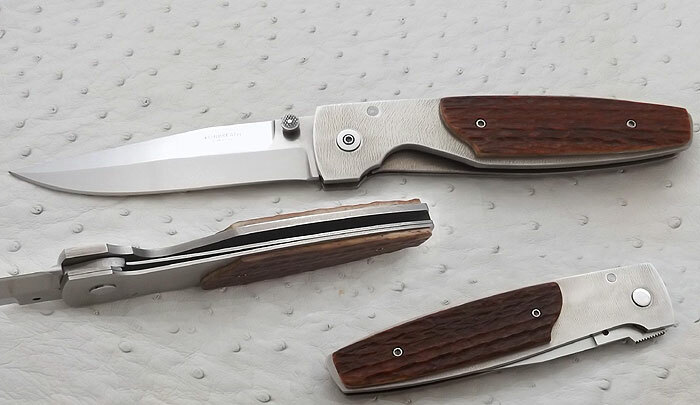 Locking mechanism is quiet unique, very precise and characteristic to many Leon's folders. 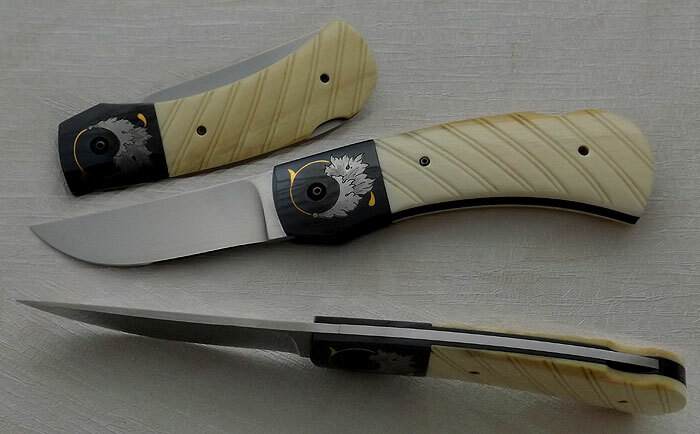 No longer making knives he is signifent name for contemporary American knife making history, for his innovating mechanisms, use innovative materials, and unusual designs. Last time I have spoke with Leon he was into archery. Maker's mosaic damascus blade 3" long. One edge sharpened. Closed knife: 3-5/8"
Titanium file worked liners. Damascus bolsters and spine. Fossil ivory scales and inlay in the thumb stud. CPM 154 blade is 4" long. Closed knife: 5-1/2"
Titanium liners and dual thumb-stud. Green G-10 handle. Stainless steal blade is 3-3/8" long .Closed knife: 5"
Duralumin handle over carbon fiber film, stainless liners and clip. Damascus blade is 3-1/4" long. Closed knife is 4-1/2" long. Combination of gold lip and mother of pearl scales with gold lip escutcheon. Titanium liners, screws and thumb stud. BG42 stainless steel blade is 3". Closed knife:4"
Titanium liners ,stainless back spring, micarta scales. Knife has interesting new assisting mechanism. "Patent pending" sign on the back. Multi bar Mosaic damascus blade is 3" long. Closed knife is 4 1/8" long. Mosaic damascus bolster. Fossil ivory scales. Titanium file worked liners. File worked back-strap. 3-1/2" ATS-34 mirror polished blade. Closed knife: 4-1/4"
Blade: Damascus Twist. 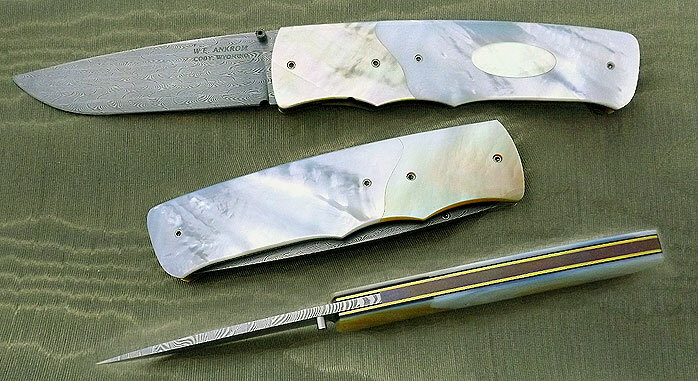 Length:1-7/8" Closed: 2-3/4"
Bolsters: Mosaic Damascus. Scales: Mammoth -gold pins. Blade ATS-34, is 2 " long. Closed knife is 3 " long. Hot blued bolsters, engraved by Joyce Minnick. Fluted scales. Interframe Lock back. ATS-34, 2" blade. Closed 3 ". Abalone inlays, stainless frame. ATS-34 stainless blade is 4-1/4" long. Closed knife is 5-1/4" long. Titanium Frame and liner carbon fiber spacer. Jigged bone scales. Stainless steel blade is 2-3/4" long. Closed knife: 3-1/2". Nickel silver bolsters and liners M.O.P. scales. Damascus Blade is 3-1/4" long. Closed knife is 4-1/4" long. 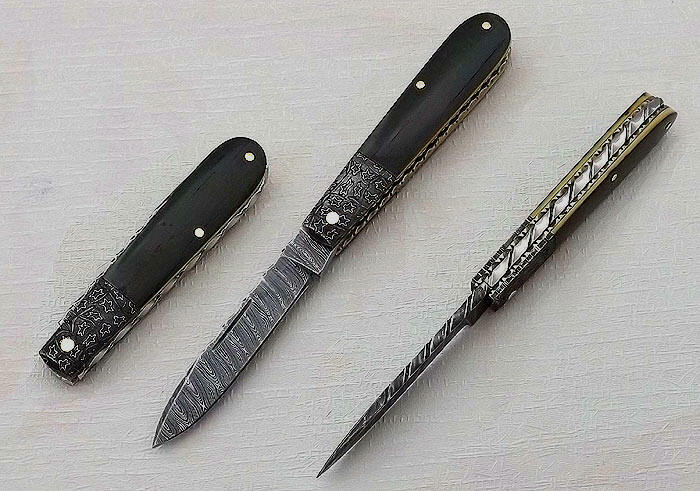 Damascus bolsters, fossil scales. Titanium liners, screws and thumb stud with tiger eye set in. File worked back-strap and part of the blade.